As a parent you must be looking for new ways and means in which to keep your kid occupied. At the same time you must be thinking of engrossing your child in an activity that is not only fun but also informative for your child. Coloring is a great way to keep your child’s active mind busy. Coloring activities gives you the freedom to decide what your child learns through them! 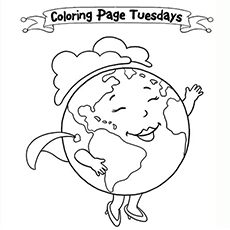 Go ahead and just pick a topic, select the coloring pages and keep your child engrossed in this learning process. 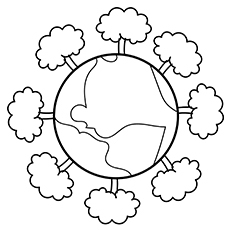 This Earth Day coloring page features the Earth surrounded by a ring of trees. Explain the significance of this depiction to your young one as he or she colors the page. Tell him the importance of trees in our lives and how they are effective in saving the Earth from dying. 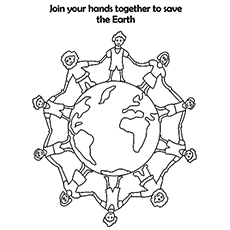 This interesting coloring page based on the theme of Earth day emphasizes the fact. 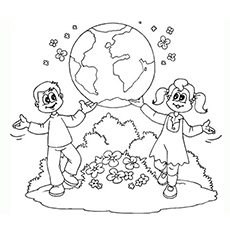 Teach your kid all there is to learn about the celebration of Earth Day through some coloring pages based on this theme. 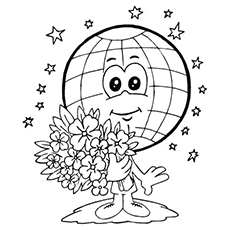 This is the perfect page for your child to color and display in his room on Earth Day! This is an interesting coloring page with a slogan. Get your child to understand the slogan and the reasons behind it once he or she is done with coloring the page. Once done, take your child to the garden and get them to plant a tree to make him nature-friendly! 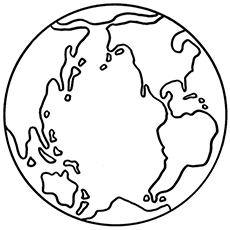 This coloring page has a message along with the chain of humans around the earth. Tell your child about how humans are dependent on earth and how we need to protect it while he or she colors the page. You could also help your little one organize a human chain with his friends to mark Earth Day. 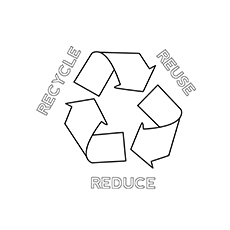 This coloring page features the important ‘recycle, reuse and reduce’ sign that is recognized all over the world. Get your child to color this page and then make them understand the meaning of this symbol with some practical examples. It is a great way to make your child eco-friendly early on in life! 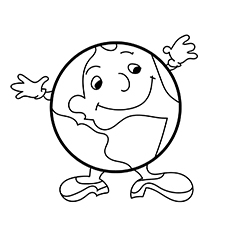 This simple coloring page that shows the earth is fun way to teach your child about planet earth. Tell him all about the land to water ratio of the earth and other basic facts about the earth while your child fills in the colors. Get your child to display the colored page on the walls of their room or on the door to their room as a poster! This is another coloring page with a slogan. It will also promote the feeling of being eco-friendly. 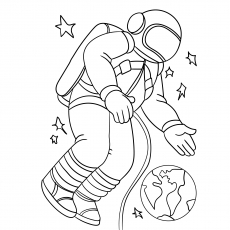 This coloring page can help make your child understand the fact that saving the Earth is a long drawn out process. It will help your child understand that little gestures made every day will go a long way to save our planet. It will also instill a sense of responsibility in your child’s mind. 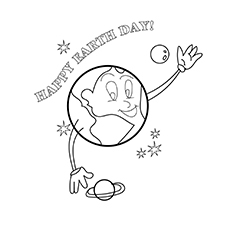 Get your children to remember the date with this fun coloring page featuring a broadly grinning Earth! The page features an interesting view of the earth where the earth is a friendly planet for all humans. This cheerful coloring page is optimistic and will fill your child’s mind with enthusiasm. This is another one of the intriguing coloring pages. The Earth cradled on a plant shows the important relationship that plants and the Earth share. Tell your child all about this relation with this coloring page as the starting point! 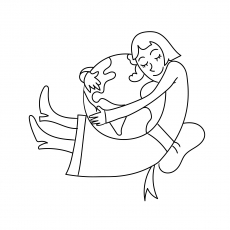 This picture shows a girl hugging the Earth and showering her affection. It is important to love your planet; you will only care for it when you hold it close to your heart. The Earth has given us the gift of life; now it is our turn to protect her when she is in danger. Don’t forget to pin up this picture as a poster once your child is done coloring it! This will teach your child to love and respect Earth for all the natural resources she has blessed us with. Have you planted any tree in your garden with your child? If not, then bring some seeds from the nursery next time you visit it, or ask your gardener to bring some seeds. Help your child to plant a tree in a garden or in an open space. Just notice your child’s excitement as he plants the sapling, he will surely water it every day and watch it grow. This will teach your child the importance of planting trees. Also, teach him in a simple way how trees help to maintain the ecological balance. 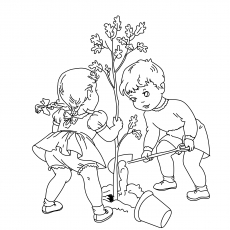 Once your child has planted his or her own tree, then he or she will certainly enjoy coloring this cute picture of a boy and a girl planting a sapling. This picture can inspire others to plant a sapling as well. Since planting trees also means saving lives. A silent message of afforestation is hidden in this picture. 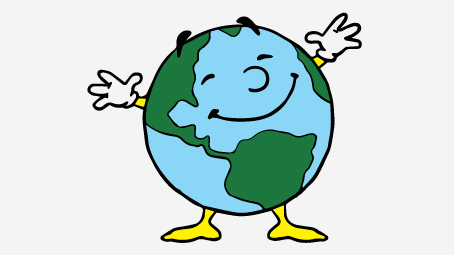 The Earth is a spherical object that revolves and rotates on its axis. The globe is a symbol to explain how the earth exactly looks like. It is the best way to teach your child about the mountains and the water bodies that are present all over the world. This will broaden his horizon of knowledge and this is how his geographical sense will become sharp. 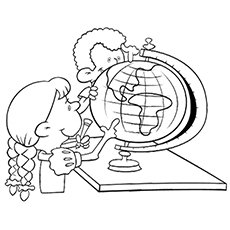 Your child will instantly connect with this picture, since two children like him are playing with the globe. You can organize fun games like spot the places on the globe once he is done with coloring. Educative games make learning easier and enjoyable. Has your child attended a cleanup drive yet? If not, organize a family cleanup drive to inculcate the habit of cleanliness in your little one. You can teach him how to keep things in order from a very early age. This will make cleanliness a natural habit. The axiom ‘Cleanliness is next to Godliness’ is very true. You feel positive after cleaning your room, the same feeling you get when you keep your surroundings clean. 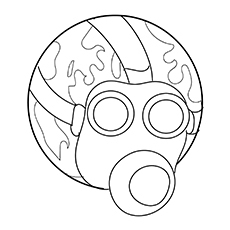 So you can use this coloring page as a learning tool and teach your child how to keep the environment clean. Climate Change is the biggest threat that the Earth is facing at this juncture. 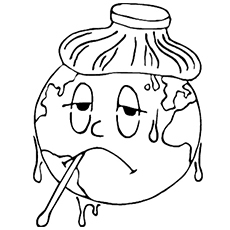 This picture of Earth having a thermometer in its mouth and an ice bag on the head reflects the increasing temperatures. Your child must curious to know more about climate change, you can say something like this: climate change is a significant time variation in weather patterns occurring over periods ranging from decades to millions of years. The extreme weather conditions can happen due to variations of solar radiations received by the Earth, plate tectonics and volcanic eruptions. Certain human activities also cause climate change, often referred to as ‘global warming’. The concentration of greenhouse gases is also responsible for global warming.Research is still going on as to how to curb the greenhouse gases and protect the delicate ecological balance. Small children love adventure and they have big dreams. Planets and stars are still a mystery to them. You can show him pictures of planets and different galaxies to your child. You can also tell him what an astronaut exactly does. If your kid has watched the ‘Toy Story’, then he will be able to associate the character of Buzz the Lightyear with this astronaut in the picture. Infact, the name of the character is inspired by the famous astronaut Buzz Aldrin, who was the second human to walk on the Moon after Neil Armstrong. The astronauts are sent to different planets and satellites to take pictures and report about what is going on in each planet. The lives of astronauts are very adventurous and exciting. One has to have a passion for exploration to take up this profession. You can show your kid pictures of some famous astronauts and their various contributions to the Space Science Research. You can also watch some interesting documentaries on Space with your little one, so that he can learn more about the Earth and other objects that exists in the Space. This is a very funny picture of Earth taking a bath. 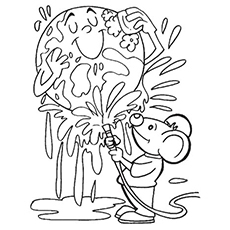 The little mouse is helping the Earth by splashing water on her with a hose pipe, while the earth soaps her entire body. This picture sends an indirect message- keep the Earth clean. Since there is so much pollution, the Earth often gets dirty and needs a bath. There is no one to care for the Earth, so she has to clean herself. You can explain to your tot why it is important to keep the surroundings clean, and how his contribution will help to prevent pollution. Since we all live on Earth, it is our responsibility to take care of her health and hygiene! Don’t forget to pin this picture up as a poster, once your child is done with coloring. This funny picture will not only make him giggle, it will also help him to remember the importance of cleanliness. Simple concepts can be explained to your little one by using funny cartoon pictures. This picture shows the Earth is wearing a protective mask. This poster will help your child to realize that it is important to prevent pollution and let the Earth breathe. Air pollution is not only destroying the Earth’s atmosphere, it is also the reason behind severe lung diseases that claim lives. Industrial fumes and the pollution caused by vehicles vitiate the atmosphere. If air pollution continues at this pace it will be difficult for humans and animals to survive. The Earth Day celebration will only be successful if the people of the world make serious efforts to protect the Earth from air pollution. Since, if you don’t respect Nature, it will surely revolt one day! This is a very cute picture of the Earth, we see her smiling. There is bouquet of flowers in her hand. There is ample scope for your cute little kid to experiment with colors. Your tot will enjoy coloring this picture. It is very important to make our Earth smile; it is only possible if we keep the Earth clean and pollution free. We can only see the stars in the night sky, if the sky is clear and free of pollution. This is why it is only possible to see stars in the villages and suburbs and not in the city, this is because of pollution. You can also take your child to a planetarium so that he learns more about stars and planets. This experience of watching stars and planets will stay with him life-long. Just watch your child’s wide eyed amazement! If you want to save the Earth it is very important to recycle and reuse objects that are usually thrown away in the garbage vat. 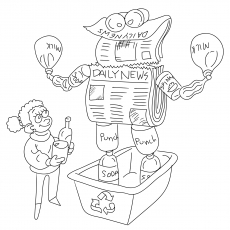 In this picture, we see a little girl has used her imagination to create a robot by recycling newspapers, milk cans, tin cans and soda bottles. This robot is standing in a plastic tub with the recycle sign. You can also organize a fun craft session at home using newspapers and tin cans. Help your child to make some interesting crafts like paper boats, music instruments, and paper cranes. Don’t forget to pin up this page in your child’s room once he or she is done coloring. Making crafts from items of daily use is fun; it is also a great way to spend quality time with your little one. 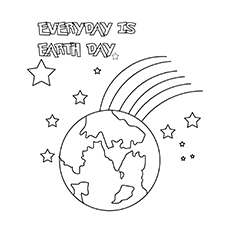 Hope you like our collection of 10 free printable earth day coloring pages. 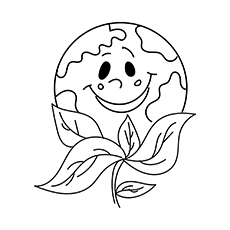 Download them, ask your kid to color them brightly, after that you can also create earth day coloring book as well. Don’t forget to share your beautiful experiences of earth day coloring pages online with us in the comment section below.